So, Australia. Head spin: where to start? Whether to go to the North-there is much warmer, but will have to go through the desert almost 2,000 km, and there are no attractions that are present in the southern half. In-General, decided to go in the direction of Adelaide, it is almost the heart of Australia, especially in the area is the famous stone Uluru (this aboriginal name, but now it is called AERS Rock – in honor of the former Prime Minister of South Australia). A few words about this stone. It is located right in the center of Australia, its size in a circle reaches 9 kilometers, and height – 400 meters. The history of this stone, no one really knows, but there is speculation that this huge meteorite. Got to him for 2 days. 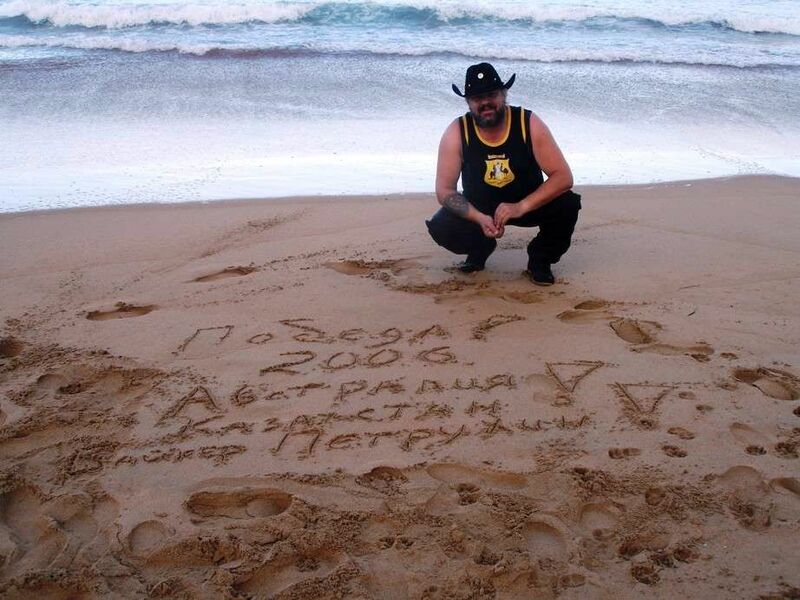 Naturally, he wrote on the stone: “there was biker Dmitry from Kazakhstan. 19.07.06”. Nothing unusual, mostly artists and tourists. But for some reason, travel agencies do not pay due attention to these historical places. I then in Melbourne asked in Russian-speaking travel Agency, on that they make emphasis in excursions on country. Answer one: the famous Opera house, Sydney harbour bridge, kangaroo, Koala, nature, famous beaches, 5-star hotels: but it’s all there in Asia! And in America! And in Europe! What about the famous jungle then? The aboriginal tribes? They say that all this is in the past, and now you can learn about it, and meet the artificial aboriginal only in museums and theaters. Although rumor has it that somewhere in the Northern areas you can see real aborigines. But, supposedly, it is better not to communicate, they become aggressive. Strangely, indigenous locals are natives, and they are virtually invisible in the country… Oh, come on, I’m gonna find a couple of natives and take a picture with them. And now let’s talk about the boomerang that I want to learn to run. Here in Australia, even hold a contest and a kind of world Championships among throwers of boomerangs. And here is I first time in life keep in the hands of boomerang. It seems like nothing special, but when my friend Quinn took it out of my hands and ran it with great force, I thought that my money was gone and that this boomerang I will not see anymore. Miracles any! The boomerang soared into the sky so high that at some moments it was not at all visible. But after 15-20 seconds it flew back to him. I will say that without special training, nothing like this happens. So, of my five launches, only one boomerang came back to me. But when I wanted to catch him, I got a big kick in the face. I still did not stop, and I still made some progress in the technique of launching boomerang. By the way, there are several types and varieties of boomerangs: for example, sports, also has to hunt small animals and birds, there are Amateur (they are usually light and don’t pose a danger to others). Of course, I took boomerangs and be sure to give them to your friends and family. Started looking for somewhere to stay around the price is greater than $ 100. But know that the closer to the city, the more expensive the hotel! Finally found a Chinese hotel for 70 dollars, but without Breakfast. In the morning, drove to Melbourne. First there was the desire to stay a day or two and wander around the city. Moreover, the rain almost never stops, and the birthday on the nose. All in together brought together! 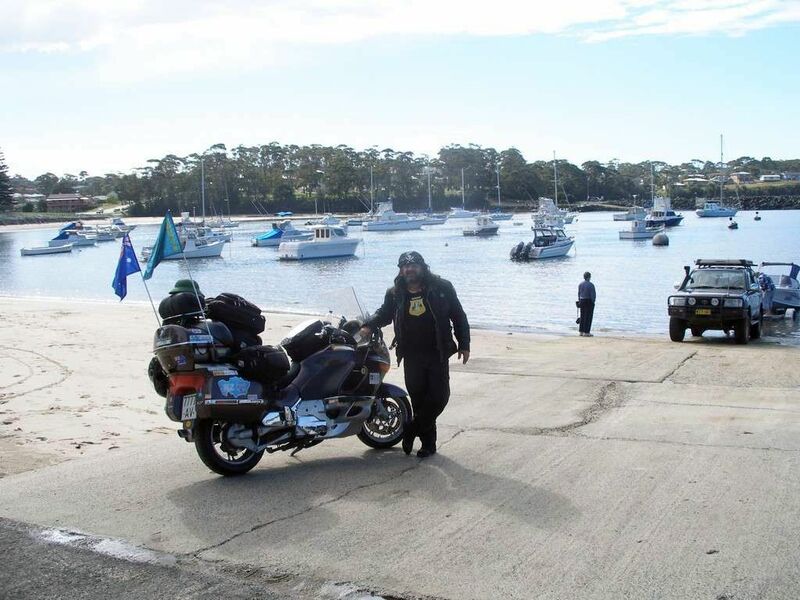 But after lunch the sun came out, and I decided to go to the ocean, as the bikers showed me. In General, Australia is washed by two oceans – Indian and Pacific. Drove up to the pier, and there are loaded two ships on the island of Tasmania. I have already the blood has begun to boil: have to go, another chance will not. Went to take the ticket, and, it turns out, the ship will sail only 3 days. Winter, not season, no tourists… I was told a plane ticket costs only $ 80, just across the street from a private airport. No, I’m not going without a bike. A friend from Canberra called, asked where I was, and asked me to go to the town of Batman’s Bay. He says weather permitting, it is possible to the coast to see the whales. Driven. And in this day I have occurred the first meeting with an aboriginal! In the camp, where I stayed, there is no phone, no cafe, and, as you know, the biker should eat every day. 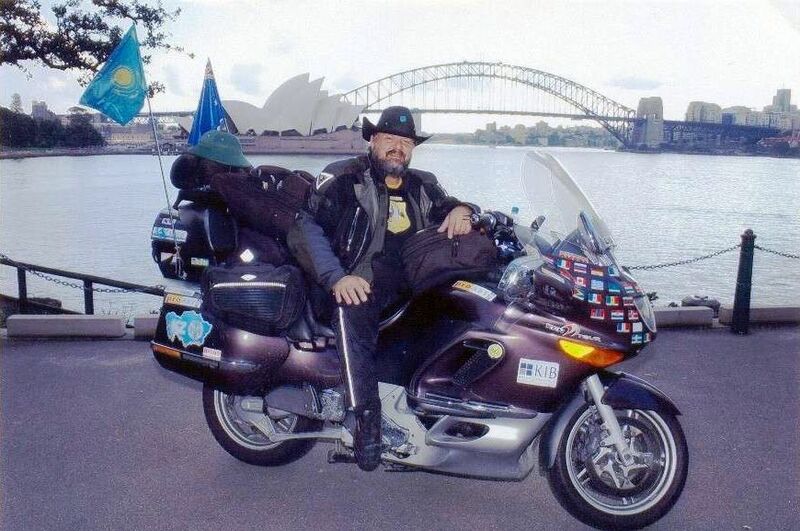 I go to the motorcycle, and there is a real aboriginal, only in a tracksuit. Talked, pofotkalis. Got into his car and drove for groceries. On the question of where to find a lot of aboriginal people, he smiles and says that they are few and all mostly live in cities. I immediately remembered America: when I was driving through 20 States of the USA, my only desire was to see real Indians as from movies. But, it turns out that I’ve been going to motorpower. It was necessary to go 50 years ago, then there would be Indians and natives. But I myself was then still the world was not. And the aboriginal turned out to be “buharik”, invited me to drink with him on the “hundred part”. Tempting, of course, but in the world I have a dry law.